Kerry voted for more Iraq funding? Earlier this week the United States Senate approved a new spending bill - primarily for Iraq war funds. The Senate vote Tuesday evening was 100 - 0. President Bush has signed an $82 billion spending bill to pay for the wars in Iraq and Afghanistan and other projects, including border enforcement and tsunami relief, the White House said Wednesday. Reached for comment, Massachusetts Senator John Kerry said, "Well, as is my custom, I am voting for this legislation now so that I can voice my opposition to it later. We continue to be lied to and decieved by this President." Asked whether it would make more sense to actually vote against a measure he doesn't agree with, Kerry responded, "Well, that's what people might expect of me, but I'm far too nuanced for that. I know when to stand for principle and I know when to go along with my colleagues. I fought very hard in Vietnam and I'm going to continue to fight hard for the people of the state of Massachusetts." Incidentally, Polipundit continues to track Kerry's promise to sign form SF-180. Perhaps John hasn't been able to get around to it yet - it's only been 103 days since he promised - as of today. Since his promise, he has been able to somehow vote 121 times in the Senate (missing only one vote) so far - guess he's just too busy to slap that signature down on the 180. That's some nuance for you. 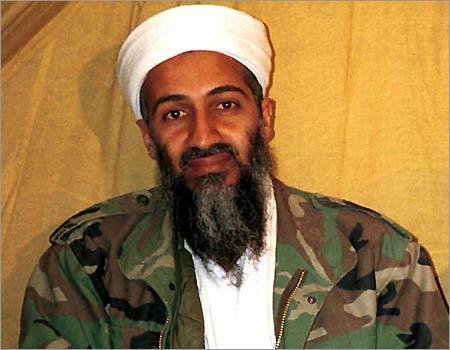 Kerry in Bin Ladin's cave? LGF has those swarms, arab elvis worship, and Arafishes. I've got my Kerry-Bin Ladin connections. Cartoonist Ryskind has Kerry Gollum'ing in an Afghan cave (click the pic to enlarge) - perhaps being medal raffish while staying on message with UBL? 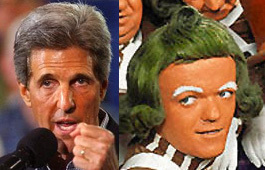 In an earlier post, I presumed to solve the September Oompa Loompa mystery. Turns out there were additional signals from the Kerry campaign using the 'soccer-ball-near-the-head' image. Closest thing to a headdress they could come up with. 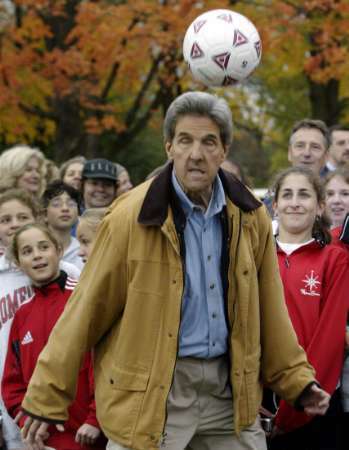 The alternative, of course, is that Kerry had a significant pasttime of practicing headers for his future soccer career. Perhaps he really was working toward taking on that fourth grade team in the picture from my previous post. Wrapped up keffiya image or soccer ball - you decide. No one could really figure out what he was up to. And so decided to go back to a more congenial coloring so as to not upstage his ally. They have been able to stay on message together and manage to look pretty much the same since. They have made some subliminal attempts at coordination for the faithful. Since it wouldn't look appropriate for Kerry to wear a doo-rag, the Kerry campaign thought it would make do with a near-the-head floating white object, with a purposeful UBL look and coordinated jackets, just so that when UBL appeared, everyone would be subliminally reminded of the common message. UPDATE: My post was (almost) entirely in jest. 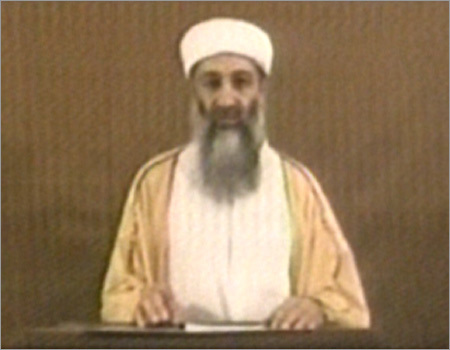 But friend Rizzn Do'Urden (not a Bush supporter) has compared the translation of Bin Ladin's video with statements from the Kedwards site. Chilling.